The holidays are filled with laughter and cheer… oh, yes… and the aftermath of stress and full schedules and shopping chaos and baking disasters and piling tasks to do. Luckily for you, my busy post-holiday bunny, there’s TaskRabbit – the task and errand service by awesome, trustworthy people. 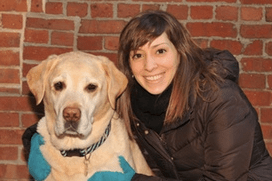 Leah Busque and her husband Kevin were on their way to dinner when they realized they needed to get dog food for their yellow lab, Kobe. With the cab already called, Leah thought there must be someone in the neighborhood that would be willing and able to deliver the dog food at a price they were willing to pay. Leah’s light bulb moment led to a domain name purchase and a precursor to TaskRabbit was born. Leah was on a mission to answer the age-old complaint that there is not enough time in the day to get everything you need done. TaskRabbit is described as an online mobile marketplace that allows people to “live a smarter and more fulfilling life by once again relying on their neighbor.” Community power is harnessed to create a virtual neighborhood, or “Service Networking,” using social, mobile and location-based technology to bring neighborhoods together to get things done. Think of all the tiny little tasks you have to get done throughout the day that don’t necessarily require your personal attention. Now, think of all the time you would save if you outsourced these tasks to reliable people. TaskRabbit is the startup that just answered your endless to-do list prayers. Check it out, find some willing rabbits, and free up your post-holiday time for your friends, family, and New Year’s shenanigans.